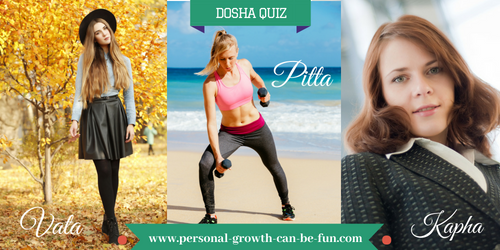 Take this quiz to discover your predominant Ayurvedic dosha. What is your dosha? Are you a Vata, Pitta or Kapha mind-body type? Doshas, or humors, are the three basic mind-body constitutional types pursuant to Ayurveda: Vata, Pitta and Kapha (collectively called the tridosha). The Vata energy is composed by air and ether. The Pitta energy is made up of fire and water. The Kapha energy is composed by Earth and Water. Each of us has an Ayurvedic constitution, where one of the doshas predominates over the others. Some people are bi-doshic, meaning that two of their doshas are equally strong. While it is true that being fully evaluated by a trained Ayurvedic practitioner is always more accurate, filling out the following questionnaire can give you a very good insight into the balance of energies that are unique to your body and mind at this time. 1. How is your body frame? Medium, with good muscle development. 2. How is your skin complexion? Warm, reddish, with freckles or pimples. 3. How is your hair? Fine, straight, with a tendency towards early graying or thinning. 4. How are your eyes? Medium sized, with a penetrating gaze. 5. How is your speech? I talk fast and/or a lot. My speech is concise and sharp, straight to the point. My words are slow, peaceful and calm. 6. What is your body temperature and favorite weather? My hands and feet are cold and I prefer a warm weather. I dislike cold and wet environments. I am warm or hot and prefer a cool weather. 7. How is your memory? I am a quick learner, but I also forget quickly. It takes me a bit to memorize things, but once I do, I do not forget it. Like an elephant. 8. What kind of personality do you have? I am a nurturing, empathic and responsible person. I am a creative, enthusiastic, inspired, lively and introspective kind of person. I like to be competitive and efficient. 9. Which of these traits are common to you? I can get jealous easily. 10. Which of these best describe your nature? I am quite corageous and brave. I am a loyal, faithful, loving person. 11. How do you react to stress? I am often restless. Under stress I become anxious and/or worried. I am often impatient. Under stress I become irritable and/or aggressive. I am easy going. Under stress I become withdrawn and/or reclusive. The following questions relate to more specific physical or emotional symptoms that you may experience when you are under stress or out of your normal balance. A. Do you suffer from insomnia? B. Do you tend to feel complacent? C. Do you feel rashes or hives? D. Do you tend to lose weight? E. Do you experience constipation or an excess of flatulence? F. Tend to overeat or maybe lose your appetite? G. Do you resort to drinking alcohol to an excess? H. Do you feel apathetic, lazy or lethargic? I. Do you lose your temper easily? J. Do you tend to retain water? K. Do you seek or long for a change? L. Do you tend to sweat profusely or have an excessive body odor? M. Do you feel fearful, nervous or anxious? N. Do you tend to eat hot or spicy foods? O. Do you experience gastritis or ulcers? P. Do you feel agitated, unsettled, anxious and restless? Q. Do you tend to sleep a lot? R. Do you put on more weight? YOUR RESULTS ARE SHOWN BELOW. Your main dosha is the one with the highest number. Once you know your predominant dosha, go to the Ayurveda Tips page to learn how to balance a deranged Vata, Pitta or Kapha dosha and restore your natural balance of health and energy in your daily life.